I remember a game called APB back in the nineties. It was on the PC and was a top-down cop car game. I only remember the vaguest of vague details about it, but I do recall one thing with clarity -- I had more fun with that than I did with this. This is APB, the luxurious opus that Realtime Worlds has been squirreling away on for years. A blend of Grand Theft Auto and World of Warcraft, this crime-flavored MMO has so much promise and so much potential, that I'm scarcely even surprised it's failed. After all, it's rare that great ideas in this industry ever pan out the way they were intended to. Surprising or not, however, APB still manages to remain disappointing from beginning to end, and by "end" I of course mean, "quietly choosing to never boot the game up again." 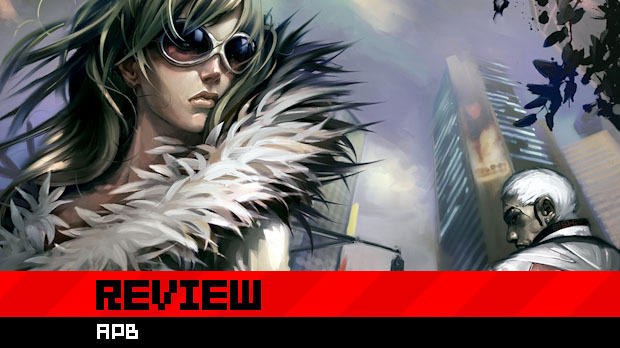 Read on for our review of APB. 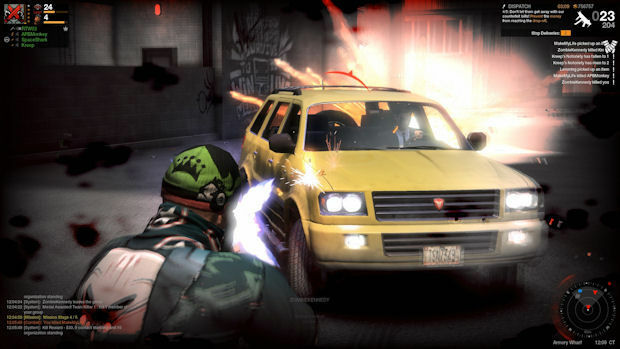 APB is set in the fictional city of San Paro, a city that has been overrun by violent street gangs. In order to combat the problem, some genius politician decided to create even more street gangs, thus leading to a conflict between the heroic Autobots and the evil Decepticons. Players can choose to be an Enforcer or a Criminal, and aside from a few minor differences (Enforcers can arrest baddies, baddies can break into cars), your game won't really be affected either way. 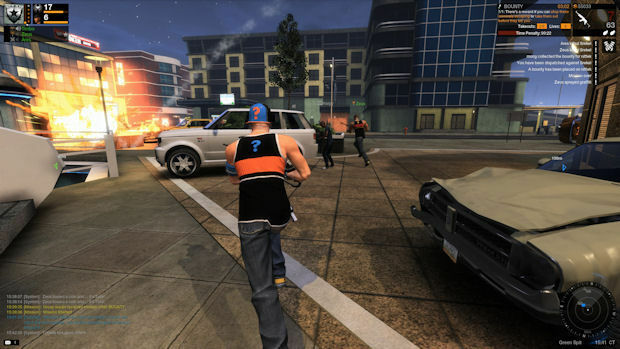 Set in a large open world populated by other players, but always managing to not quite be an MMO, one could best describe APB as Grand Theft Auto with human players acting as the cops. A fantastic idea in theory, but in practice, it's shockingly boring. APB's major problem is that there's simply very little to do in the spacious streets of San Paro. Players join different factions and perform missions for them, but the missions are limited, repetitive and nearly all consist of the same task -- going to different locations to kill each other until the game gets bored of making you run around the map like a headless chicken. With no story, no progression, no leveling and an extremely limited selection of rather dull missions, APB simply has nothing to offer in a world populated by more unique, deep, intriguing and far better presented games. Even worse for a game of this type is the distinct lack of impact you have on the world around you. 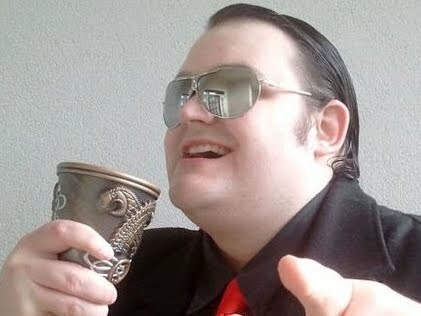 There is no territory to claim, there is no real "war" between the Enforcers and the Criminals. San Paro is as static and unchanging a city as you could ever hope to find. Even if you kill one of the NPCs that pop in and out of the world like ghosts, no big deal. An Enforcer may be dispatched against you, and you'll either die or survive. Then it's as if nothing ever happened. APB is a sandbox in which the sand has been replaced by smooth round rocks -- unyielding, unable to be shaped in any way, and uncomfortable to sit in for too long. Perhaps if the game mechanics were good, the combat exciting or even if the driving happened to be fun, then there might be something to keep players hooked. Unfortunately, APB's mechanics seem outdated to the point where even Grand Theft Auto III was tighter and more polished. Combat feels like something ripped from the days when developers were still struggling with third-person cameras. Fighting consists of running around and firing rather crap guns at each other, hoping against hope that more of your bullets hit the target than the opponent's. That is, when you're not fighting somebody who's spamming their grenades. Of course, money can be earned to buy better guns, and that naturally leads to a huge imbalance in the combat system. If you're up against opponents with the better weapons, you will die. Skill counts for very little when upgrades make the difference, and even if you want those upgrades for yourself, good luck finding them. APB is light on information and many in-store items are locked with no information given as to how one unlocks them. As far as the basic controls go, they are functional but not superb. Controls are rudimentary at best, doing just enough to let you run, aim, crouch and shoot. As far as driving goes, it's not the worst I've ever seen, but it's far from the best. Cars are just about acceptable in the handling department, although most vehicles tend to feel slow and turning corners is more a case of sliding than smooth steering. Again, it's nothing GTA III didn't already do, and do with far more style and elegance. San Paro itself is also very badly designed, full of dead ends, pointless roads that lead nowhere, and a series of small walls that can't be climbed or jumped over, boxing players in wherever they go. With mission objectives that randomly flit across the map at a moment's notice, being able to get from A to B efficiently is as important as it is impossible. Hammering home the archaic nature of the game's design is this total inability for player characters to deal with their surroundings. Players should be able to scale a four-foot high wall, but they can't, and we're expected to believe this is acceptable in a game that has been released in 2010. When players aren't shooting each other in the face (or trying to at least), they can hang out in the social district. There is an impressive selection of character customization where new clothes, accessories and hairstyles can all be obtained and tweaked with. Of course, as with guns, many of the options are locked out with no unlock information, meaning that you're going to have to ask around if you want that hockey mask. Many items can be bought with real-world money as well as in-game cash, and you can kit out vehicles, design your own logos, and do all you can to make San Paro feel like it's at least lived in. All this, of course, is mere aesthetic and thoroughly personal to yourself. Never once will you do anything significant in the world of APB. APB has a noble idea at its heart, and could have been something truly special. Unfortunately, the game suffers due to a complete lack of... well, anything. From beginning to end, the game is soulless and alienating, with a sterile city that lacks energy, a grindingly repetitive set of missions, and absolutely no effort made to let the player feel like they've accomplished anything. You get better guns and new clothes, but this vapid mass of stuff is no substitute for a real game with real objectives, real experiences, and real fun. It's the kind of thing I'd expect to see in a Bratz videogame, not a full-fledged attempt at a new type of game from a respected British developer. It's as if the developer had this great concept and felt that the premise alone was all it needed, that making a city and a game that used the bare minimum was "good enough" to sustain such a terrific premise. It's not good enough though. Realtime Worlds is so much better than this, and it's horrible to see that years of effort have produced this substandard, outdated, thoroughly pointless game. You can't even shoot through windshields.